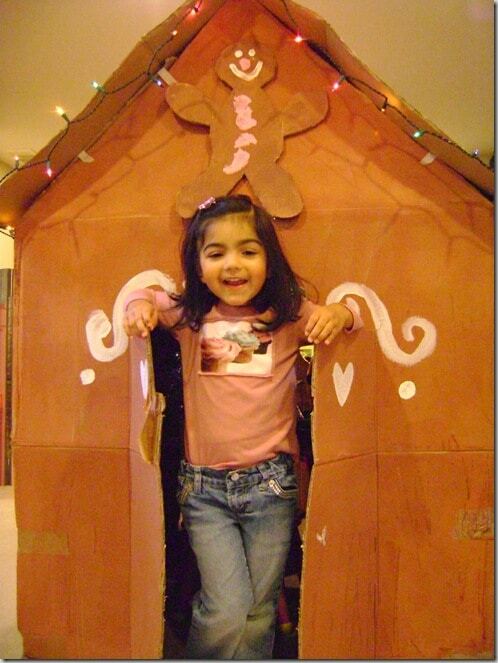 Life Size Cardboard Gingerbread House! 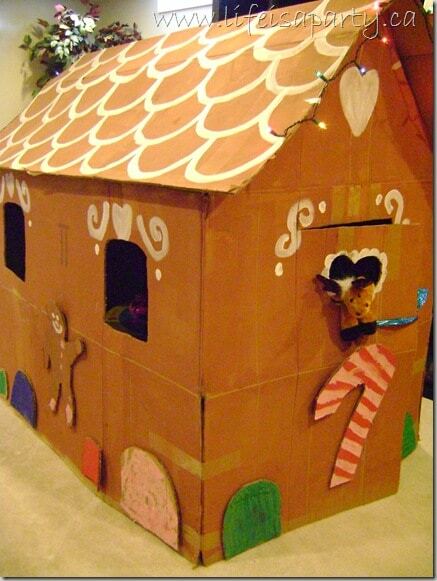 Last year I stumbled upon this great idea at Alpha Mom to make a life size cardboard gingerbread house for the kids. I thought it would be great as a playhouse in the basement over the holidays, and my kids do love it! 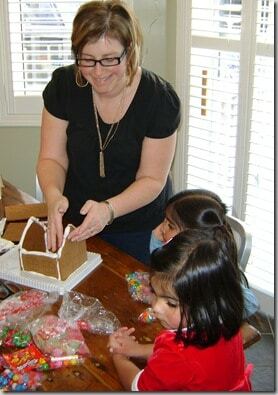 We invited some friends from out of town to join us for a gingerbread day, and the fun began. We did do a little prep before they arrived. The first challenge was finding great big boxes. I actually found mine on Craig’s List, someone had got some new furniture, and couldn’t bear to throw out the great boxes, but had no use for them himself. Well I had a great use for them, so my husband picked them up one night after work. Then we set to work cutting the boxes, there is a good pattern on Alpha Mom, you use two boxes per house, one for the house, one for the roof. 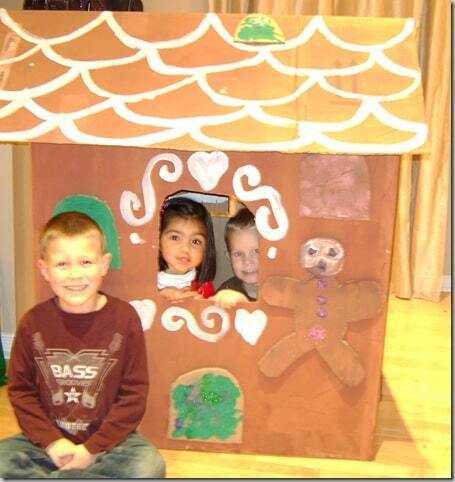 We made two houses, so our friends could take one home with them. They fold flat for easy transport and storage 😉 After they were cut out, we painted them gingerbread brown, and left them out in the garage to dry. When our friends arrived we put the kids to work cutting and painting gingerbread men, candy canes and gumdrops to decorate the houses with. And of course, they needed a little glitter too. We also added some “icing” detail in white to the houses. 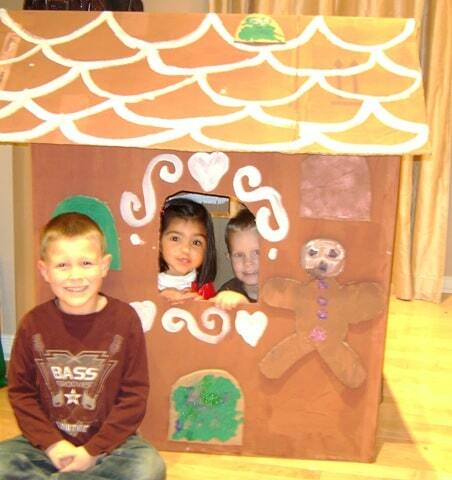 While the paint dried, we had fun making real gingerbread houses. 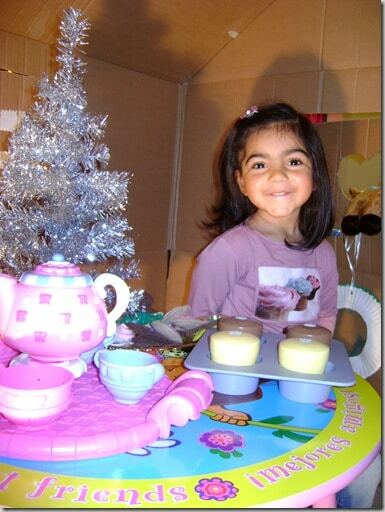 We bought the pre-made kits, where all you have to do is put them together and decorate. I have to say they sure are easy! The kids loved making them, and it helped them wait for the big ones. After the paint was dry, we attached the candy cut outs with a glue gun, and the real fun began; play time! This is the one our friends took home, a little smaller and easier to fold up and put in the back of their mini-van. Here is the one we made, set up in our basement this year. When we were done with it last year and putting all the Christmas decorations away, I just folded it up and stuck it up against the wall in our storage room, to dig out again the year. The girls were so excited the night we put it up this year, I’ve never seen them clean up their play room so fast to make room! This year we also added some Christmas lights. Each side is a little different, with lots of windows, and doors on each end. Inside we put a small table and two chairs, a little Christmas tree, and got it all set up for a Christmas tea party. This was a time consuming, but really easy project, and I have to say that my little girls just love it. 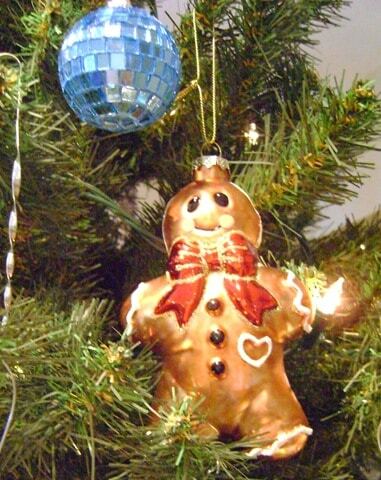 We finished the day off with a pretty little gingerbread boy tree ornament for our friends and us, so that every year as we put it on our trees we’d remember our gingerbread day together and how much fun it was. This post is linked up at Blue Cricket Design, Ladybug Blessings, Beyond the Picket Fence, Somewhat Simple, Tatertots and Jello, Under the Table and Dreaming and Skip To My Lou. My preschoolers would love this–thanks so much for linking up! No way?! 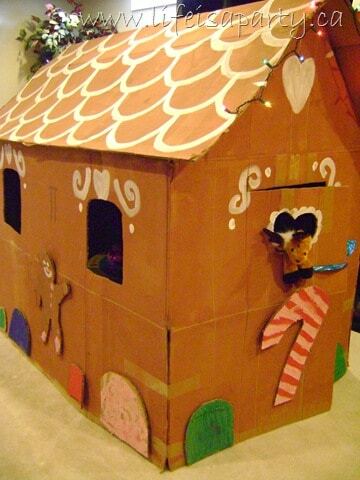 That cardboard house is just too stinkin’ cute!! 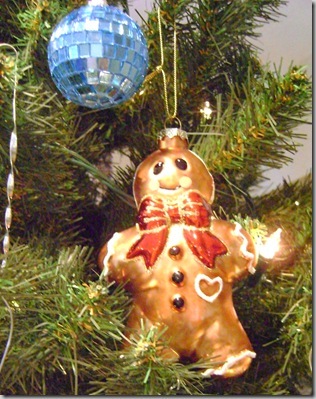 I am definitely adding this to my list of activities for next year’s gingerbread man party!